I’ve just returned from a 1-day symposium in Cave City, Kentucky. I heard about this symposium, and where it was located and the price made it irresistible! For $40, there were 4 sessions plus lunch with a speaker! Also, it is located in an area of Kentucky where I desperately needed to do some hands-on research. So, after work ended on Thursday, the husband and I headed southward to Bowling Green, KY. We stopped at a soup restaurant in Indianapolis on our way out of state and when we reached the Ohio River, we pulled off the interstate and found a spot for a picnic supper. Very nice! Except it took us about 15 minutes to figure out how to get back on the interstate! Ha! The next day, we woke up and headed off toward Logan County, KY, where I needed to do some hands-on research. This research involved my 3rd-great-grandfather, Aaron Ballard, and his first wife Elizabeth Witt. My husband and I first stopped at The Jail Archives in Logan County. And yes, the records are housed in the old-time jail vault! The first thing I found was they had terrific copies of the marriage licenses that I had found on microfilm, one for Aaron and Elizabeth in 1822 and one for when Elizabeth remarried a man named John Jefferson Young in 1831. Then, since they kindly have some indices online, I already knew what equity case I wanted to view. The ladies working there were beyond friendly and very knowledgeable about Logan County. I checked a couple family files and then checked the card catalog for the equity cases, looking under Ballard. Eureka! Finally, an answer to what happened between Aaron and Elizabeth! It deserves its own post, though, and I am still processing the information I found. We took a quick tour of the old jail cells (2 stories! They stacked the inmates!) and then it was off to the clerk’s office for more research. I was most curious about the daughter of Elizabeth. Her name was Caroline, and she was born 1 October 1823, roughly 9 months after Aaron and Elizabeth married. I was looking for anything that stated maybe Elizabeth’s father gave her his last name or maybe Mr. Young did, but that search came up short. I know that Elizabeth and Caroline were living with Elizabeth’s father, Robert Witt, in 1830 as they are all enumerated together. The man Elizabeth remarried, John Jefferson Young, died an early death in 1833, so on the 1840 census, Elizabeth and Caroline are again living with Robert Witt. Caroline Ballard was married twice, first to John Desper who must’ve died young and then to Thomas Beasley. However, those events did not take place in Logan County and I didn’t have time to explore Todd and Butler counties, unfortunately. I must say, Logan County’s records are a wonderful source and go back to the end of the 18th century, and very well indexed! It was an extremely productive day! The next day was the symposium in Cave City. Again, we met the friendliest people! It was a small event, maybe 60 or so people, but that’s perfect! The sessions are small, you can easily ask the speaker questions, just a more laid-back atmosphere. 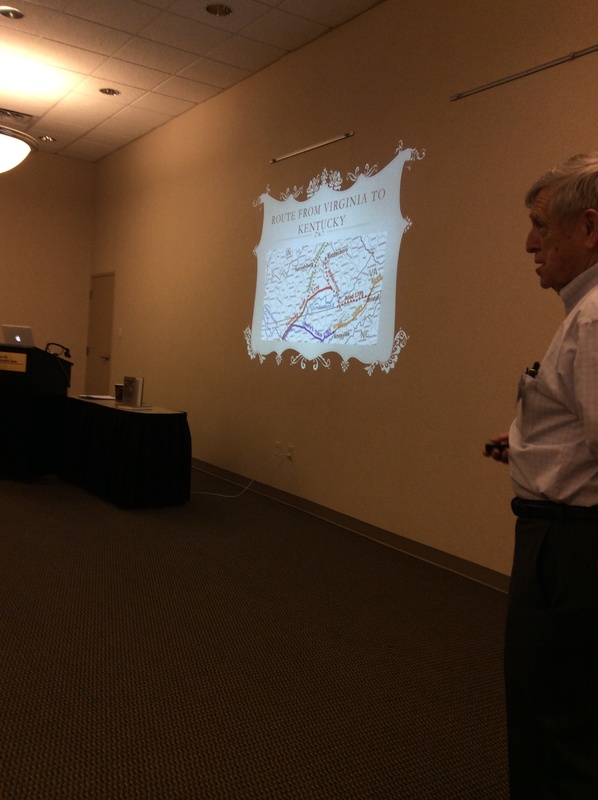 My first session was perfectly tailored for me and my ancestral study…pioneers from Virginia to south-central Kentucky after the War of 1812. The lecturer was Mr. Glen Conner, and he really had us thinking of what it was like to make that trek through the Cumberland Gap and on the Wilderness Road. I then sat in for a DNA lecture (one can never hear too many of those to get it straight in your mind!) and then a session on spreadsheets and the magic they can do with your data. We had a nice lunch with a presentation about headstones…very fascinating! Mr. Conner and a very helpful map. After lunch, we decided to head back to Indiana since I had to work in the morning. It was a good thing we left when we did as we encountered horrific thunderstorms with heavy rainfall…makes for white-knuckle driving on I65! One thing I have learned since really delving into searching family history is it can’t all be done from the computer; you have to visit places of your ancestors. And that, I feel, is a big part of going some place…to walk where they once walked.